No part of the planning of our cities is more prone to idiocy than housing. I don’t mean the planning of the housing that most of us live in, obviously, that hasn’t really changed for more than a century. It is housing of the ‘poor’ where so much professional attention and intellectual debate has been focused and where the idiocy is to be found, and it is the tenants of social housing that have suffered. This idiocy doesn’t arise from any particular malign intent on the part of the urban professions. Quite the contrary, on the whole they had nothing but the best of intentions. The post-war settlement that created the National Health Service and the welfare state included the promise that everyone would be well housed and that on the whole this would be done by the state. Within the clean white lines of high-rise council estates or the Arcadian promise of New Towns, the people of Britain would be given light and airy, warm and healthy, spacious and efficient homes (or machines for living as the Bauhaus called them). Their landlords would be the local council rather than Rackman-like landlords, and their estates would be designed to promote community spirit and with just the right amount of play space, greenery, shops and local services. Slums were cleared and politicians competed, as they do today, to build more and more homes each year. It was all tremendously exciting for the architects and planners of the 1950s and 60s. Finally they had the opportunity to put into practice all the radical social ideas that they had been taught at college and heard about at conferences (such as the Eighth Congrès Internationale d’Architecture Moderne that took place in England in 1951). The early schemes like Roehampton in London and Park Hill in Sheffield were all over the architectural press as were the Mark I new towns. As Martin Richardson said of the Greater London Council at the time, “it was like a giant nursery school whose principle objective was the happiness of its architects”. We look back now at the estates borne of all of this excitement and it’s hard not to wonder what they were thinking. How could anyone imagine that the brutal environments of concrete walkways, tower blocks and parking courts, or the maze-like low-rise estates, strewn with litter and controlled by gangs, could ever provide a humane place to live, to bring up children or to grow old? But they did – the well-meaning idiots. This is an object lesson in how idiocy takes hold. Start with a spoonful of utopian dreaming, mix with academic theorising about communities and how they interact, stir in a dollop of ideological certainty and add pinch of science fiction. Bake for a few years in the architecture and planning schools and then teach uncritically to generations of students and promote to politicians – local and national – desperate for a solution to their housing problems. And of course the movement had its Starchitects who set the tone, challenged preconceptions and dominated the architectural mags. People like the great Basil Spence whose terrifying Hutchesontown C Estate in the Gorbals was seen as a triumph, or the Bond villain Ernő Goldfinger1, whose Trellick Tower is still considered one of the finest buildings of the era. Or indeed Alison and Peter Smithson, whose iconic Robin Hood Gardens estate in London’s Poplar has been much in the news recently because of the debate about its demolition that sums up so well the point that great architecture and social housing don’t always mix. However, the idiocy that took hold in the 50s and 60s had its roots in an earlier generation and the prime idiot in this respect was Swiss-French architect Le Corbusier, who said some really stupid things about cities which many people took seriously. He was profoundly unhappy with the sheer messiness and inefficiency of cities and indeed society as a whole. He suggested a society ruled by the unelected intelligencia would sort everything out and build cities that worked. Across most of Europe this was considered an interesting intellectual idea, but in Britain we fell for it hook line and sinker. The post-war planners, ignoring the authoritarian anti-democratic bits, definitely saw themselves as the intelligencia who would sort out the city. They overlaid Corb’s theories with a heavy dose of ideology, making it difficult for anyone to argue against the new orthodoxy. They were aided by politicians who were reforging Britain in the ‘white heat of technology’ and boasting about the number of slums they had cleared and houses they had built (which peaked at more than 400,000 homes a year in the late 1960s – three times the rate in recent years). Communities that had existed for a century or more were ripped up and rehoused in towers and streets in the sky. Working class communities were consigned to years of misery at the mercy of gangs and drug dealers who were the only groups to which the new environments were ideally suited. It is just as well that this moment of madness has passed and we have stopped building housing disasters! The problem of course is just that – it is not that we have learned our lessons and started to build humane social housing: we have just stopped building social housing at all, at least on any significant scale. The tragedy is that the modernist experiment in social housing tarnished the very idea of state-sponsored social housing. This can be seen in David Cameron’s announcement in January this year of the redevelopment of 100 estates of “brutal high-rise towers”. 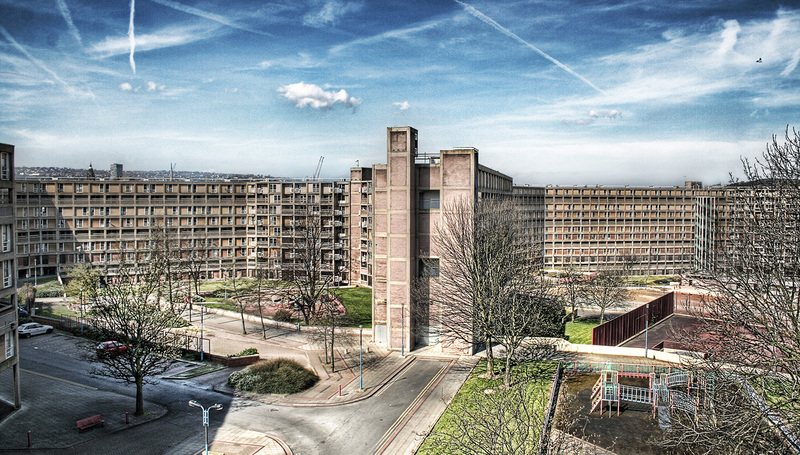 In the government’s eyes, brutal high-rise estates are synonymous with council housing, symptoms of a failed socialist experiment. The result is that we are once more consigning the poorest in society to the mercy of private landlords, paid for through a housing benefit budget that is roughly equivalent to the amount that we once spent on building social housing. One type of idiocy has unfortunately been replaced by another. With all the high-rise crap architecture along the river Thames, West London, history seems to repeat itself a bit…. But this time they are not the socialists or communists but the so-called Market: people who simply fill their pockets. And they get away with it!